The signs on the picturesque ruta del vino (root of the vine) are not always clear. 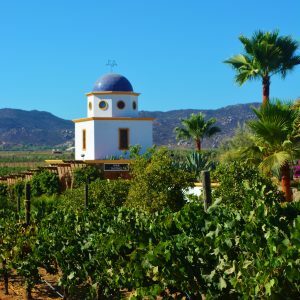 The wine country of Mexico’s Valle de Guadalupe is growing by leaps and bounds, and part of its rustic charm is the dirt roads and their hit or miss signs. But to Tru Miller, at Adobe Guadalupe Vineyards and Inn, the signs couldn’t be clearer. She is the savvy owner, operator and much-loved matriarch of Adobe Guadalupe. But, it almost didn’t happen this way. 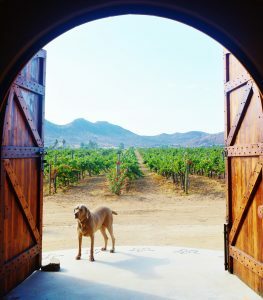 Only a few hours from San Diego just across the Mexican border, the “Valle”, as the locals call it has become one of the most intriguing and appealing wine regions in North America. Green valleys, boulder covered hills, mountain ranges, stunning sunsets and some fine wines make this a perfect weekend destination. 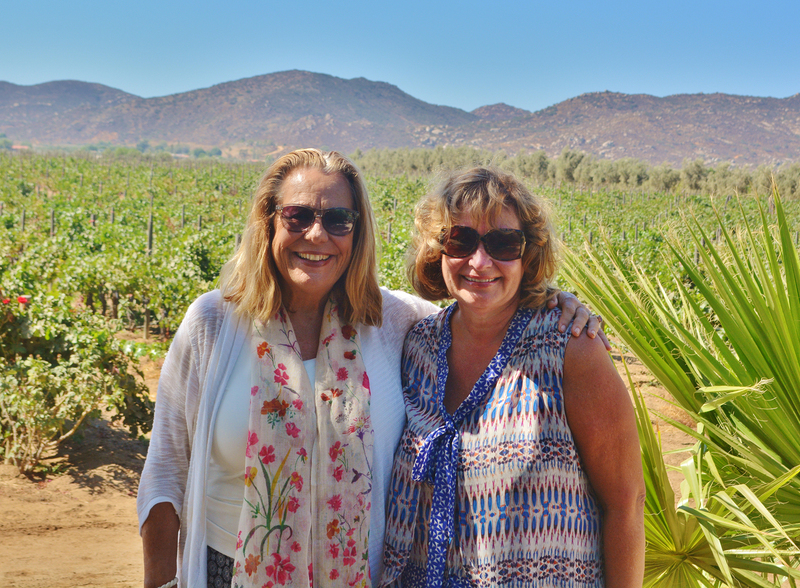 Tru and her husband Donald moved to Valle de Guadalupe from Orange County in 1996. 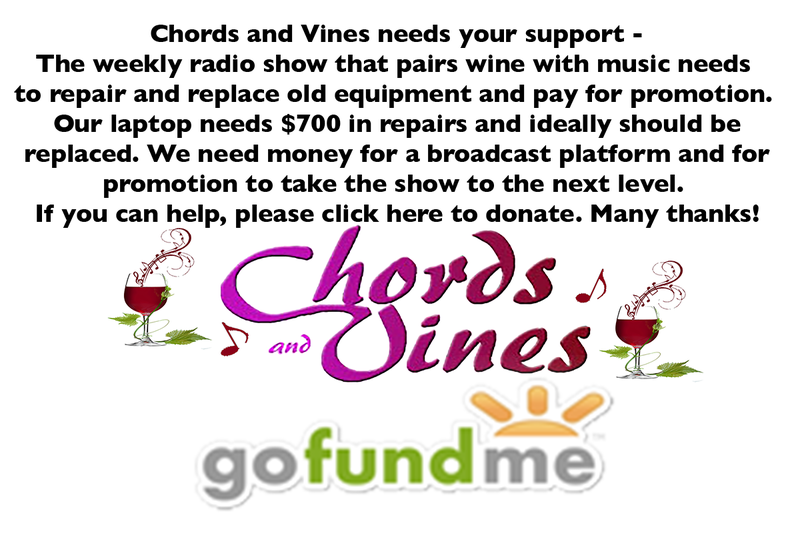 They’d considered purchasing a vineyard in Sonoma, but, in a twist of fate, their beloved son Arlo, was tragically killed in a car accident. Arlo talked about taking a year off from college to work with his Dad on the vineyard project. He’d become fascinated with Mexico, falling in love with its culture and people. When Tru and her husband went to collect Arlo’s personnel effects, one item, Arlo’s picture of Our Lady of Guadalupe adorning his wall, for some reason tugged at her heart. After Arlo’s death, Tru couldn’t bear the thought of buying a vineyard. In her mind that idea was put to rest alongside her son – or so she believed. 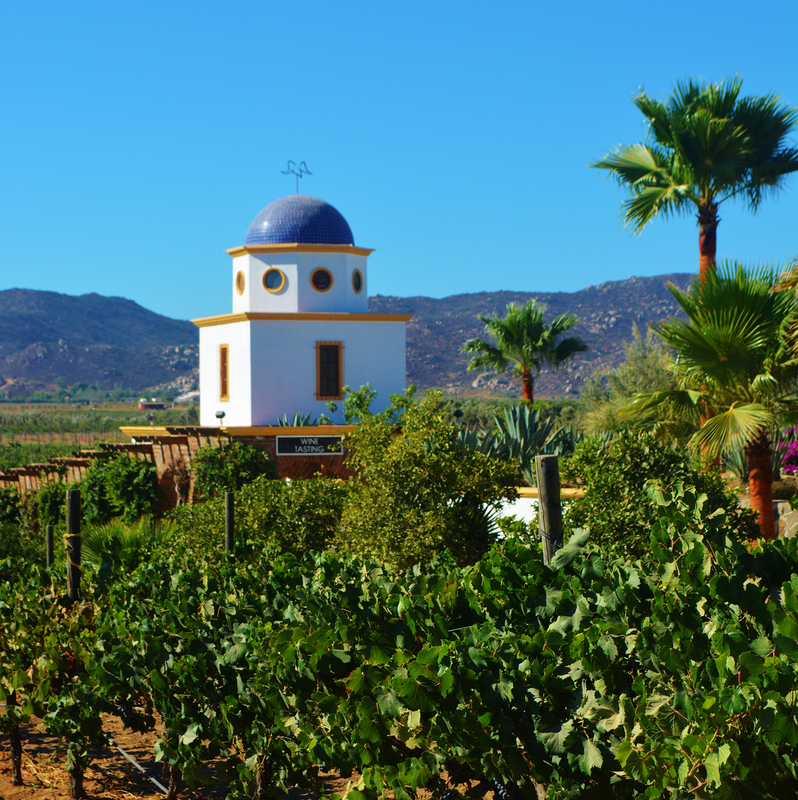 Donald later encouraged Tru to accompany him on a trip to Valle de Guadalupe, where they found land for sale, rekindling his dream of owning a vineyard. After the trip, Tru talked with her mother in Holland about the land. A few weeks later, an envelope arrived filled with Dutch Guilders. Tru’s mother explained she’d had the money set aside for a rainy day but felt strongly the Millers should buy the property. Unbelievably, the guilders were the exact amount the land was selling for; despite that the cost of the property had never been discussed. Tru could only smile at this unexpected sign. The Millers purchased grapevines from France, and built their home. Tru wanted the name Adobe Guadalupe. Though strongly recommended she have alternate names, Tru stuck to her guns. As it turned out, the name had never been registered elsewhere. Things continued to miraculously fall into place. 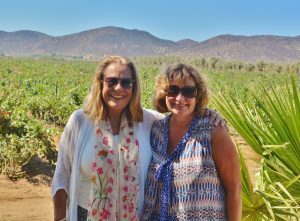 When it was time to hire a winemaker, it was fortuitous that Hugo d’Acosta, the pioneer of Mexican winemaking and the best in the Valle agreed to work with them. Next came finding a talented agronomist. The well-respected Ing Jose Fernandez, working for another vineyard at the time, was looking for a change. Adobe Guadalupe seemed the perfect fit. Twenty years later, he is still with Adobe. His gift to the winery of 350 olive trees has yielded the best olive crop ever. And his friendship with Tru is one she treasures, especially after the death of Donald three years ago. Tru explains she could never run Adobe without Fernandez’ guidance and expertise. A dirt road leads to the winery, taking visitors past acres of green vineyards, Tru’s beloved Azteca mares, and hazy mountains in the distance. Instantly, we are awed by Adobe’s classic beauty and timeless elegance. Our room is named Rafael, one of six warmly appointed rooms of the inn named after archangels. There are no phones or televisions in the room – the perfect opportunity for unplugging. And each room leads to a quiet courtyard with a fountain. A refreshing pool on property provides the ideal place to sun, swim and relax. 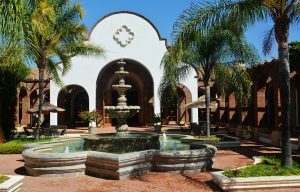 The owner inhabits a private part of the Adobe, but, guests are encouraged to make themselves at home in the adjoining living room and library. The living room is gracefully sophisticated with a marble fireplace between expansive arched windows overlooking the vineyards. Shelves of books and tables filled with photos and family collections add an element of warmth and love to both of these inviting rooms. 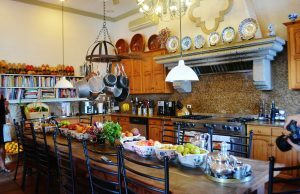 The kitchen, with its long rustic table, beautifully set with fresh flower centerpieces, invites guests to breakfasts crafted by its talented chefs. Fresh fruit, coffee and freshly squeezed orange juice is followed by a main breakfast entrée. Our Huevos Rancheros, “Ranchers Eggs”, was made with eggs from the vineyard chickens, accompanied by homemade salsa, fresh guacamole and beans. The garden adjacent to one of the vineyards grows an abundance of vegetables used by Adobe’s chefs. We loved the wooden shoe collection atop on a walled bookcase containing cookbooks from all over the world – our first indication of Tru Miller’s Dutch heritage. Located off the kitchen is a formal dining room used for luncheons, special events, or in our case, a five-course dinner paired with wines from the vineyard. The romantic dimly lit room with round tables, linen tablecloths, flickering candles, china and silver settings felt elegant and refined, yet warm and welcoming. Each dish was more creative and tantalizing than the last. 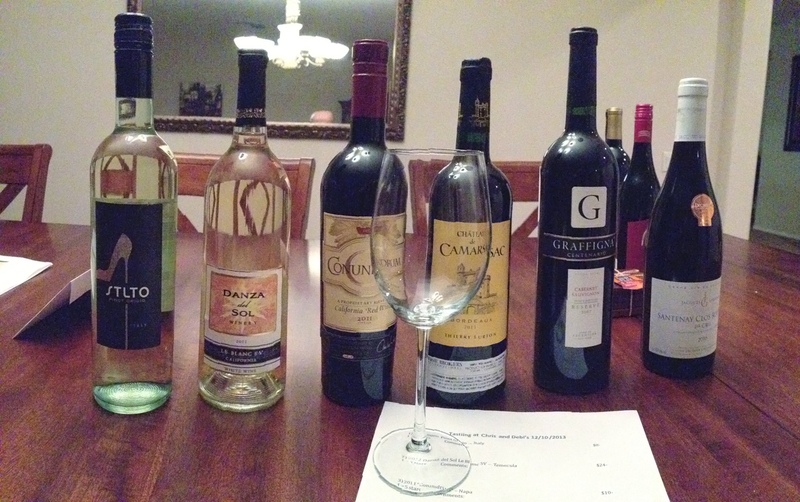 And servers were generous with their wine pours. Once inside the tasting room, we were more than convinced this vineyard knows something about growing grapes. 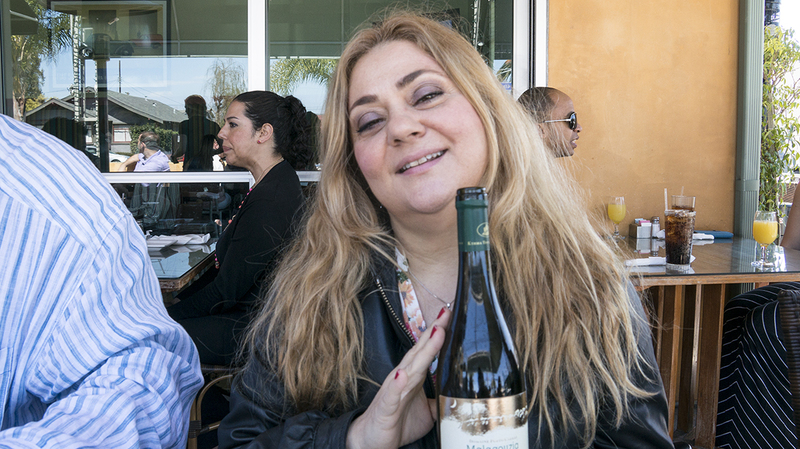 Winemaker Daniel Lonnberg comes from Chile. He was 100% in favor of moving the winery in the direction of producing a white wine. And Adobe became the first winery in the Valle to produce Rosé at a time vintners were convinced the only grapes that would grow here were reds. 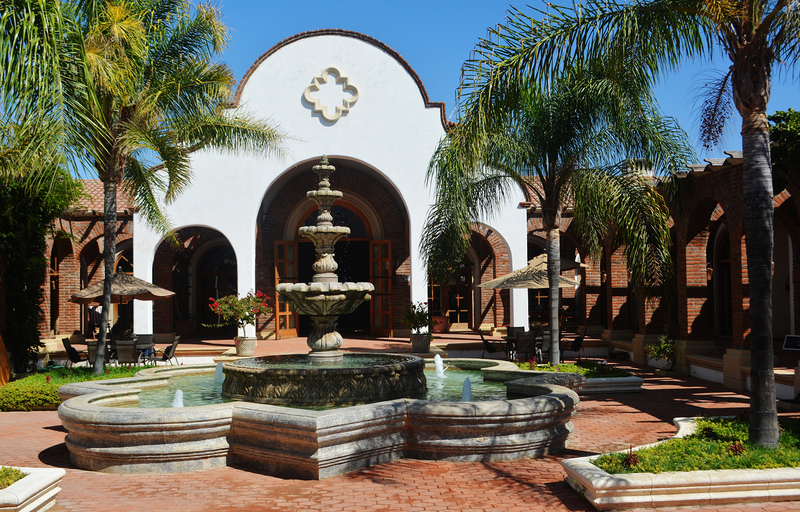 The tasting room which provides VIP tastings for its guests is situated in a cool temperature high-ceiling domed structure that also serves as the wine cellar with hundreds of French and American oak barrels of wine. An artisan-designed wrought iron chandelier from Jalisco is the hallmark of the tasting room. Wine experts Luis and Jimena do an excellent job walking patrons through the wine process and vineyard’s history. And when the massive wooden doors are opened, the views of the vineyard ahead look like a painted masterpiece. 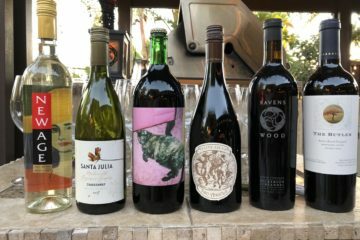 Twenty vineyards produce some of the best wines in the Valle from at least nine grape varietals. Reds carry the names of the archangels because Tru believes they are her son’s best friends. Their Chardonnay is called Jardin Romantico, a bright, light white with tropical fruit aromas and fresh, crisp taste aged in stainless steel – a perfect accompaniment to a hot day. 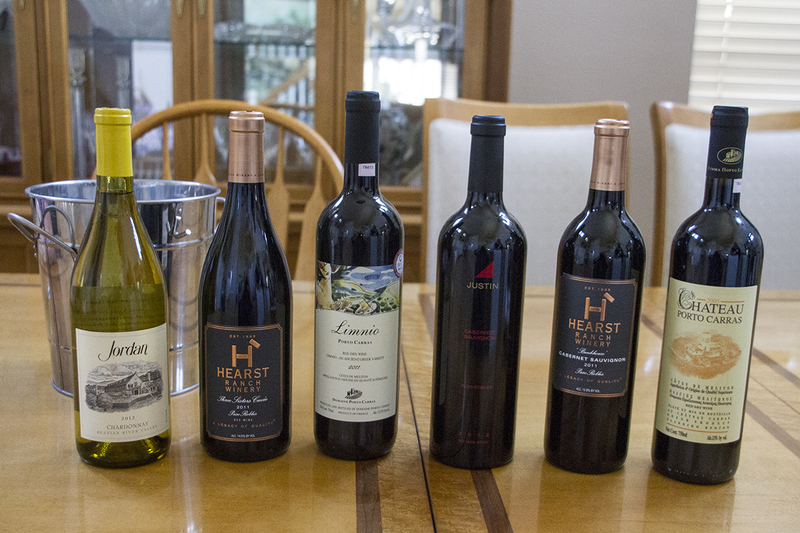 Reds consist of blends like Gabriel, an elegant wine with rounded tannins and long finish. Serafiel, my favorite, is a more intense blend aged 10 months in French and American oak with aromas of fruit, chocolate and vanilla. Kerubiel, a complex blend of four grapes inspired by France’s Rhone Valley has a deep ruby color with aromas of berries and soft tannins highlighting the fruit. Miguel, another blend, has a deep red color, fruitful aromas and taste, but also a tobacco aroma from its oak barrels. The restaurant on property, El Jardin de Tre Galline specializes in wood-fired pizzas. Chef Costantino Dal Bon hails from Venice and his creations are something to be savored – slowly if that’s possible. Adobe Food Truck located near La Tienda de Adobe, the winery’s store and public tasting room, adds a splash of color and fun to the property as does its owner, Leda. Mouth-watering tapas, salad and sandwiches are made fresh daily along with local beer and Adobe Guadalupe wines. If horseback riding through the vineyards sounds tempting, Adobe’s well-trained Azteca horses and expert guides take riders through some of the most picturesque of terrains you’ll ever experience. Fate indeed appears to have played a major role in creating the magic of Adobe Guadalupe and the love that is so evident here. C.S. Lewis once said, “And whatever strange things may happen to you, let nothing turn your mind from following the signs”. That is what Tru Miller did. 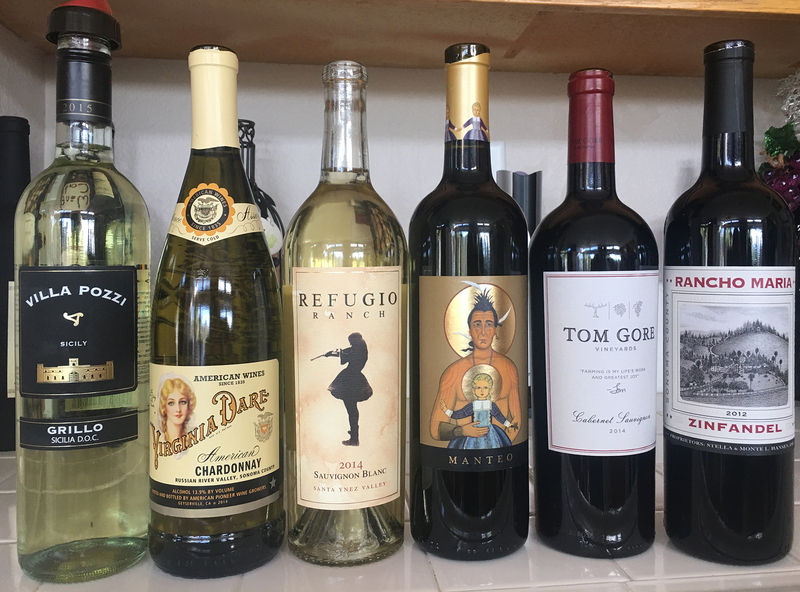 As a result, visitors to Adobe Guadalupe Vineyards and Inn will be forever thankful.